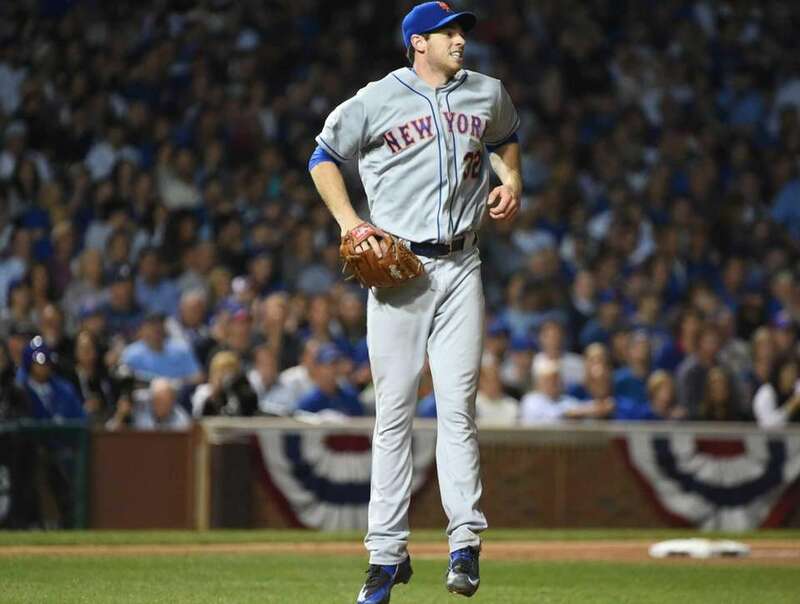 See scenes from the New York Mets' 8-3 win over the Chicago Cubs in Game 4 of the NLCS on Wednesday, Oct. 21, 2015 at Wrigley Field. 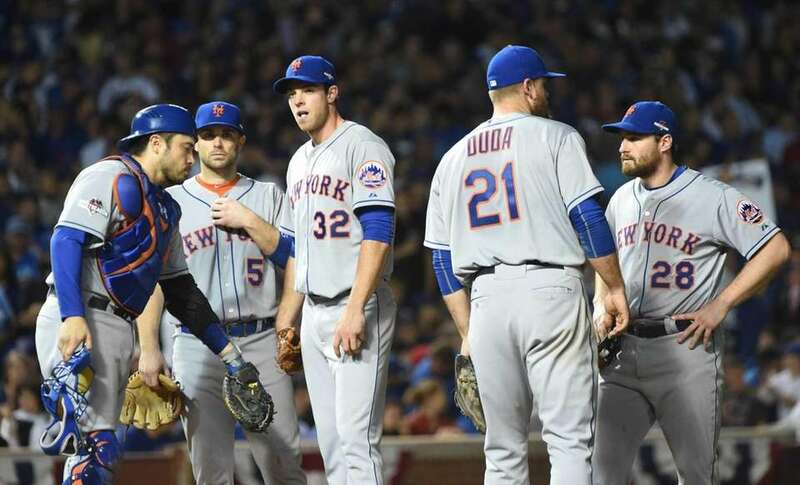 See the Mets' post-game celebration here. 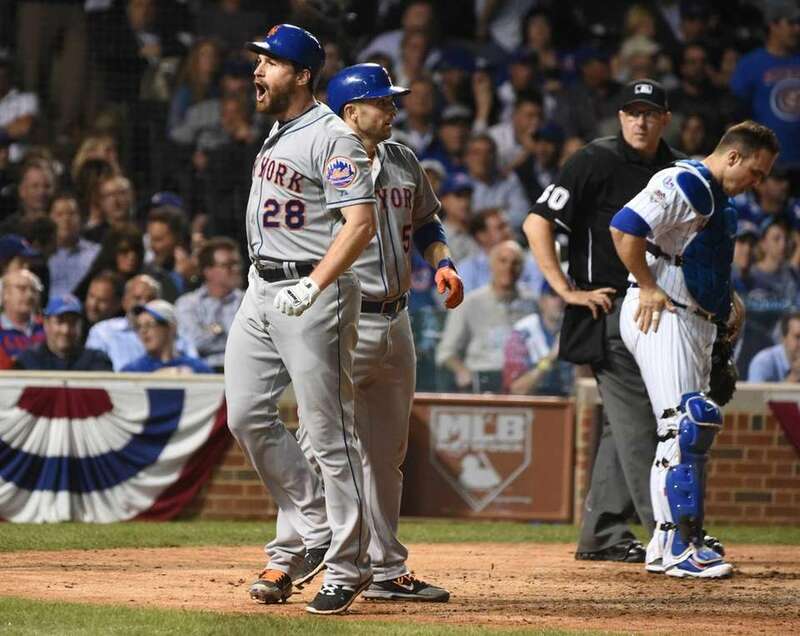 New York Mets second baseman Daniel Murphy (28) smacks the eighth inning during Game 4 of the NLCS against the Chicago Cubs at Wrigley Field on Wednesday, Oct. 21, 2015. 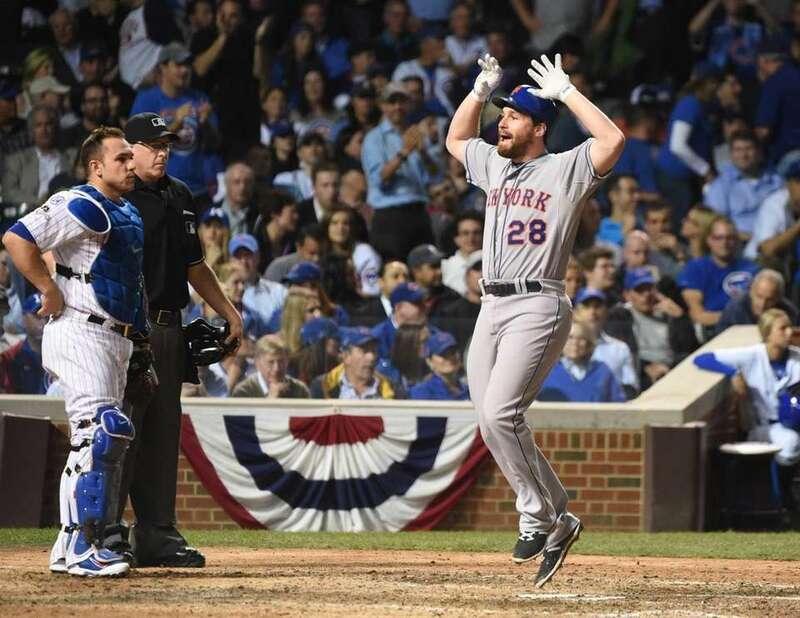 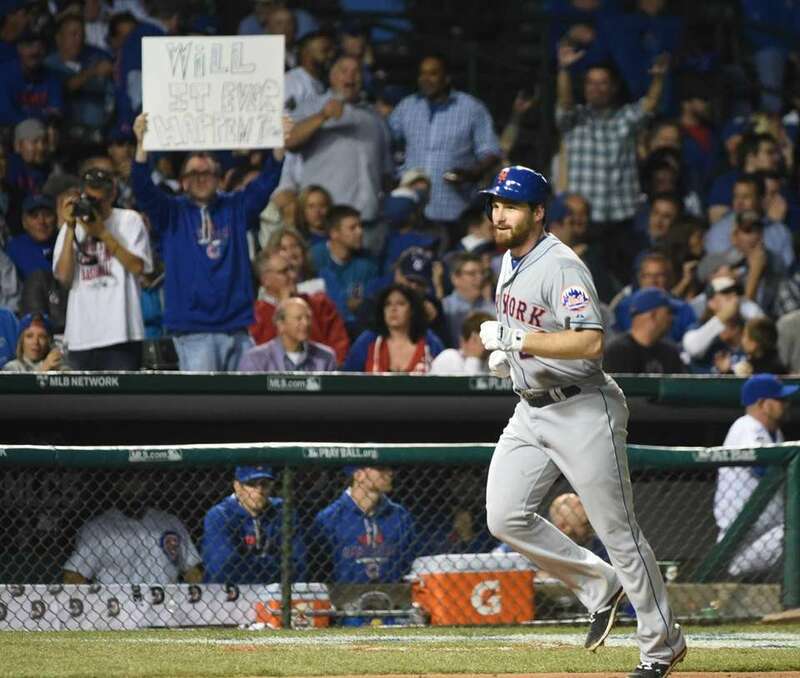 New York Mets second baseman Daniel Murphy (28) reacts in the 8th inning after his homerun during Game 4 of the NLCS against the Chicago Cubs at Wrigley Field on Wednesday, Oct. 21, 2015. 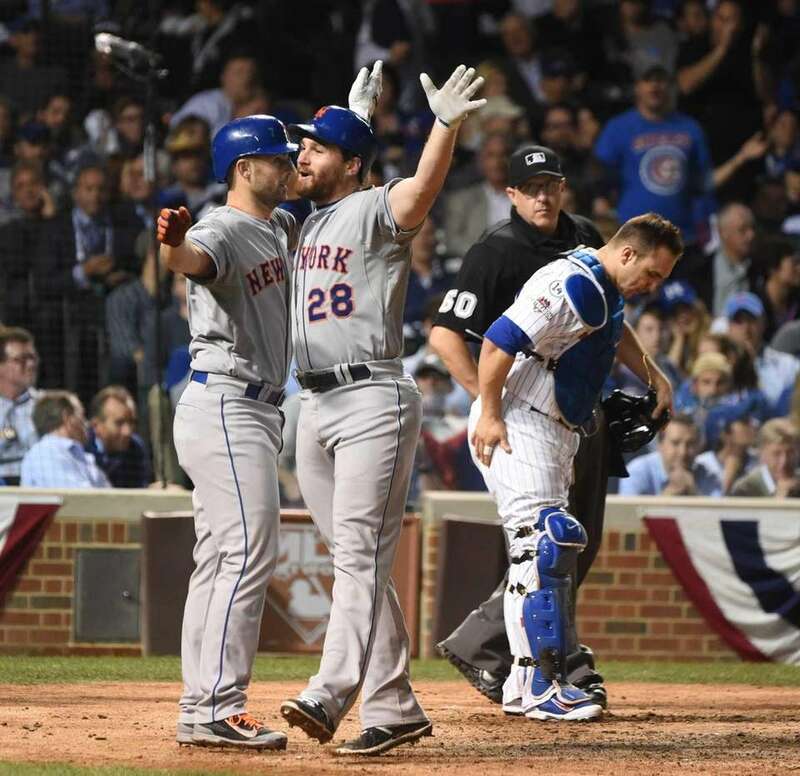 New York Mets third baseman David Wright (5) celebrates with New York Mets second baseman Daniel Murphy (28) in the 8th inning after his homerun during Game 4 of the NLCS against the Chicago Cubs at Wrigley Field on Wednesday, Oct. 21, 2015. 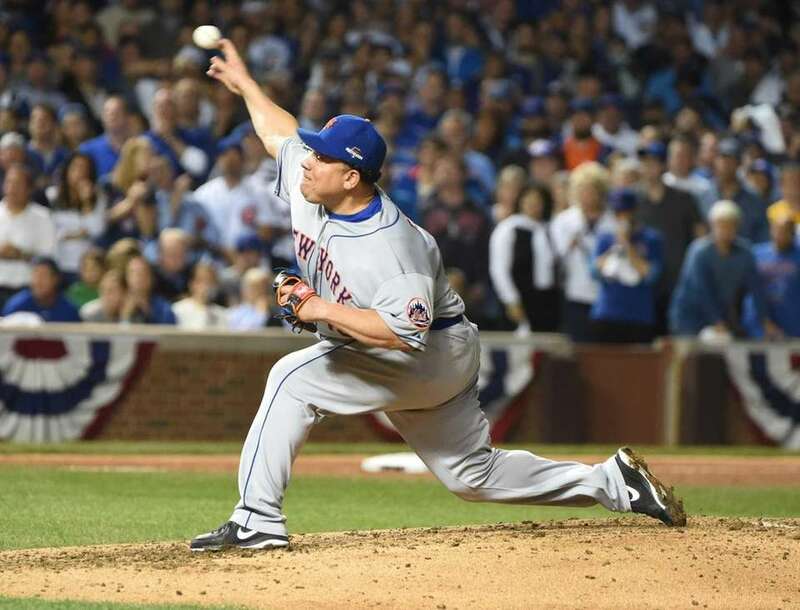 New York Mets starting pitcher Bartolo Colon (40) delivers the pitch in the fifth inning during Game 4 of the NLCS against the Chicago Cubs at Wrigley Field on Wednesday, Oct. 21, 2015. 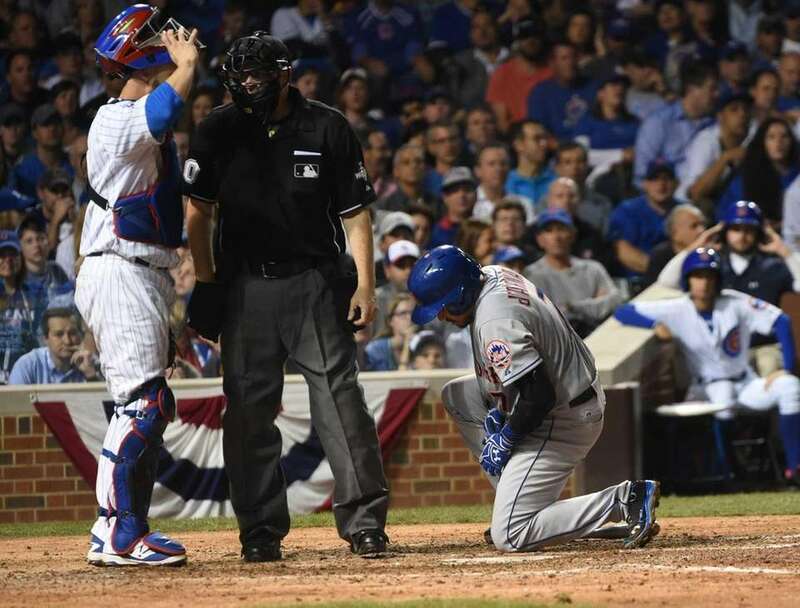 New York Mets catcher Travis d'Arnaud (7) is hit by s pitch in the seventh inning during Game 4 of the NLCS against the Chicago Cubs at Wrigley Field on Wednesday, Oct. 21, 2015. 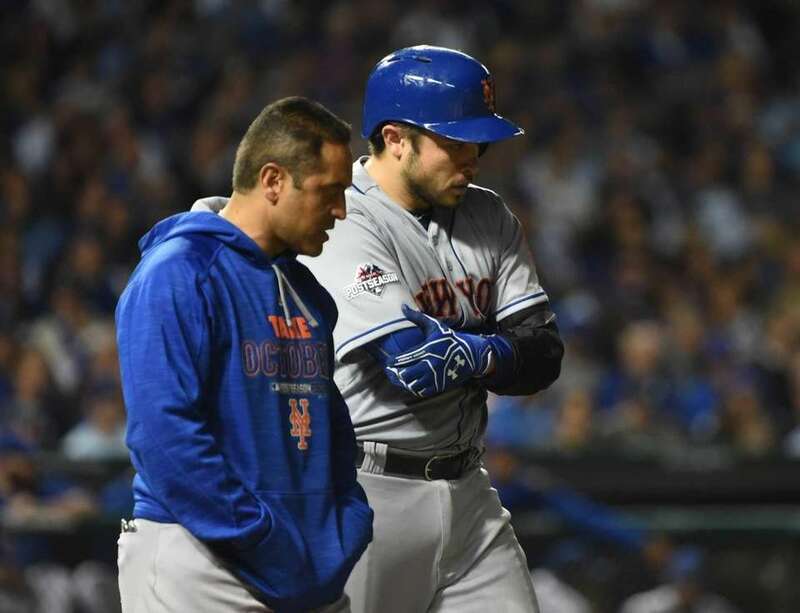 New York Mets trainer Ray Ramirez looks at New York Mets catcher Travis d'Arnaud (7) after he is hit by a pitch in the seventh inning during Game 4 of the NLCS against the Chicago Cubs at Wrigley Field on Wednesday, Oct. 21, 2015. 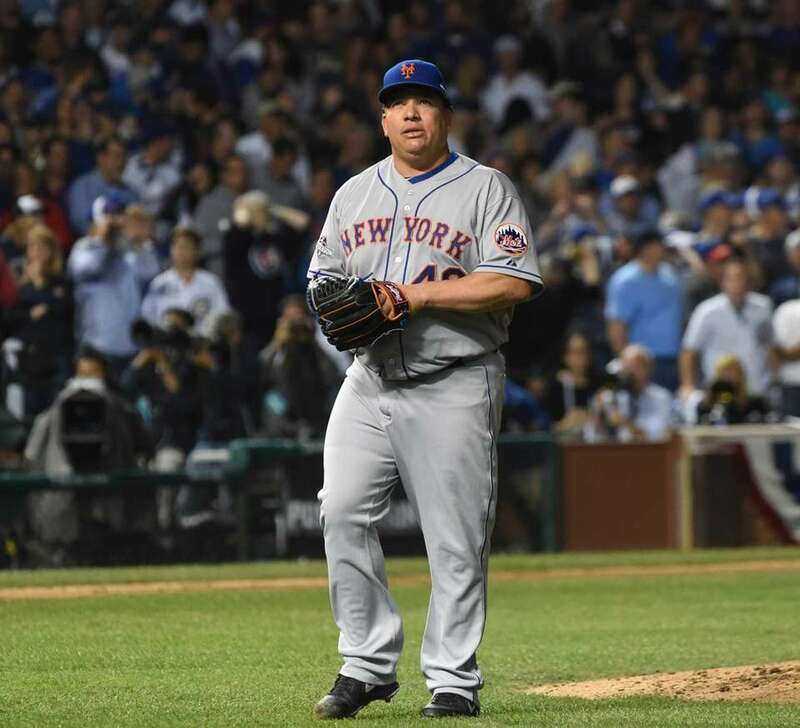 New York Mets starting pitcher Bartolo Colon (40) walks to the dugout after striking out Chicago Cubs third baseman Kris Bryant (17) in fifth inning during Game 4 of the NLCS at Wrigley Field on Wednesday, Oct. 21, 2015. 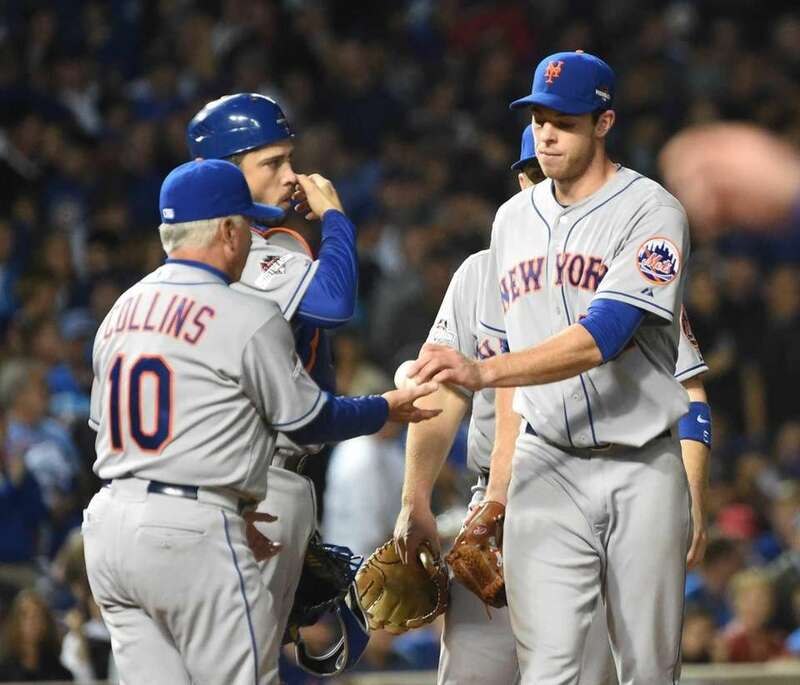 New York Mets starting pitcher Steven Matz (32) hands the ball to New York Mets manager Terry Collins (10) after being taken out og the game in the fifth inning during Game 4 of the NLCS against the Chicago Cubs at Wrigley Field on Wednesday, Oct. 21, 2015. 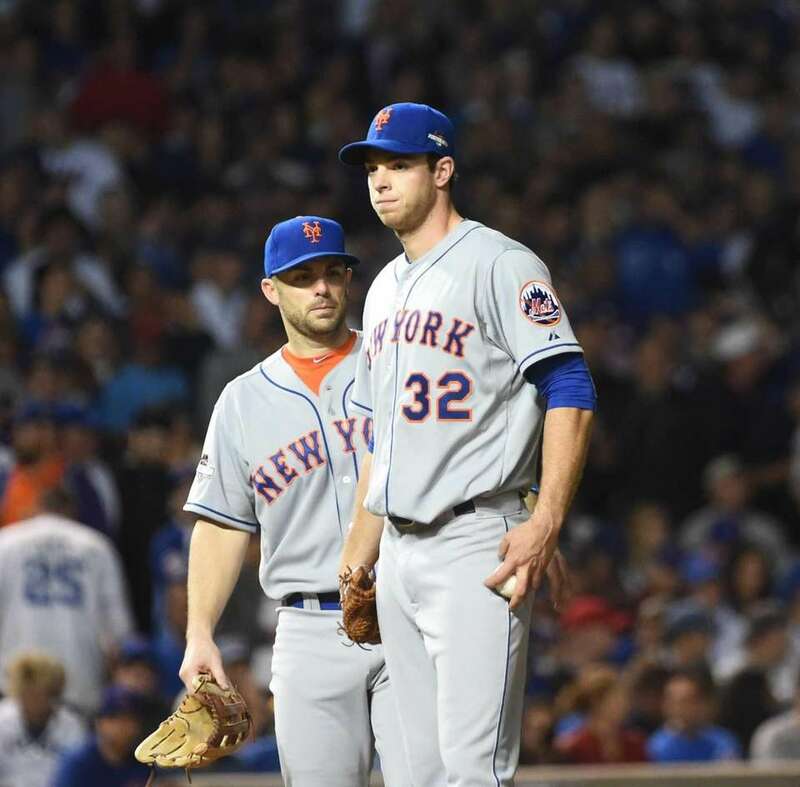 New York Mets starting pitcher Steven Matz reacts in the fifth inning as he is taken out during Game 4 of the NLCS against the Chicago Cubs at Wrigley Field on Wednesday, Oct. 21, 2015. 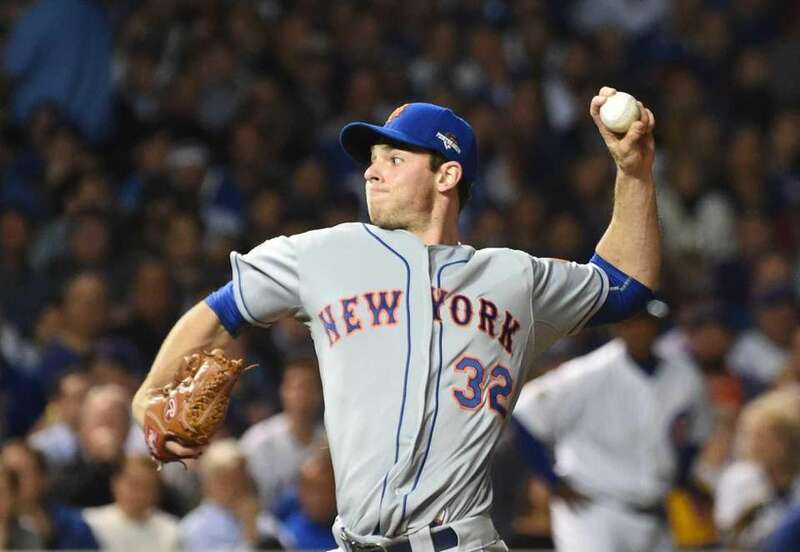 New York Mets starting pitcher Steven Matz (32) reacts in the fifth inning as he is taken out during Game 4 of the NLCS against the Chicago Cubs at Wrigley Field on Wednesday, Oct. 21, 2015. 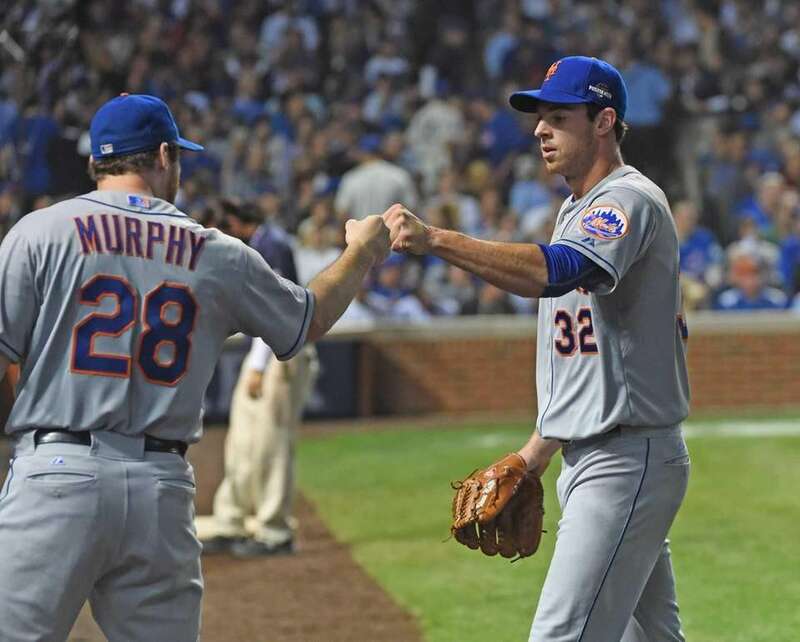 New York Mets second baseman Daniel Murphy (28) fist-bumps New York Mets starting pitcher Steven Matz (32) after the third inning during Game 4 of the NLCS against the Chicago Cubs at Wrigley Field on Wednesday, Oct. 21, 2015. 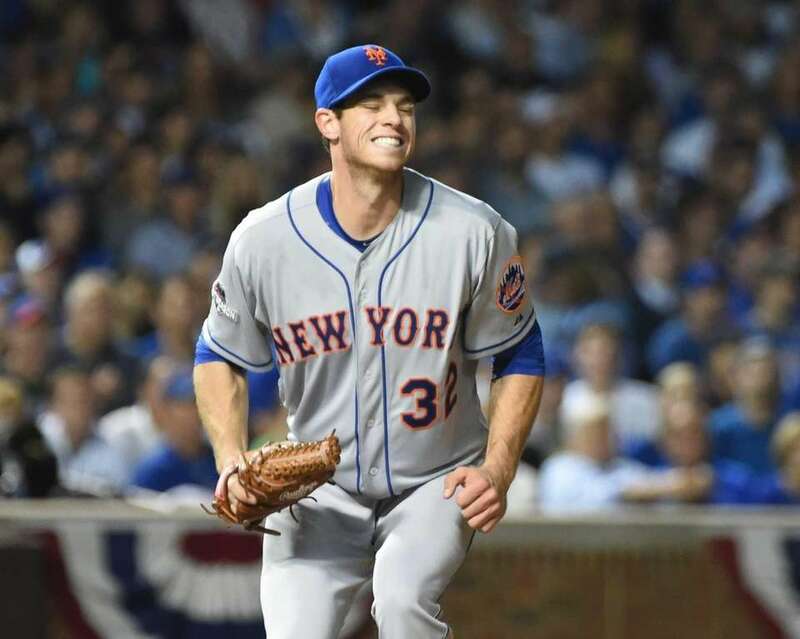 New York Mets starting pitcher Steven Matz (32) reacts in the fourth inning after a double by Chicago Cubs rightfielder Jorge Soler (68) during Game 4 of the NLCS at Wrigley Field on Wednesday, Oct. 21, 2015. 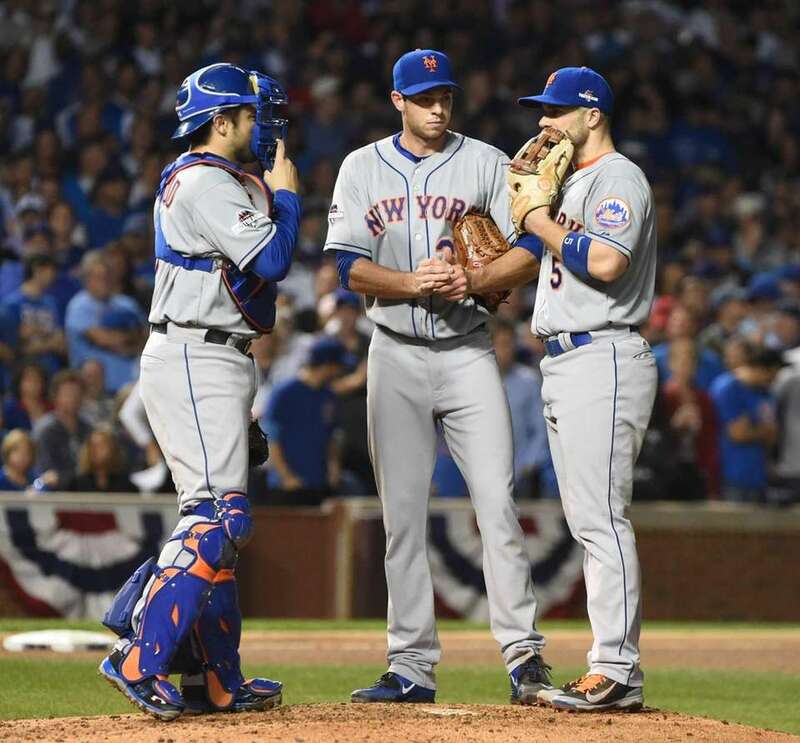 New York Mets catcher Travis d'Arnaud (7) and New York Mets third baseman David Wright (5) go to the mound to talk with New York Mets starting pitcher Steven Matz (32) in the fourth inning during Game 4 of the NLCS against the Chicago Cubs at Wrigley Field on Wednesday, Oct. 21, 2015. 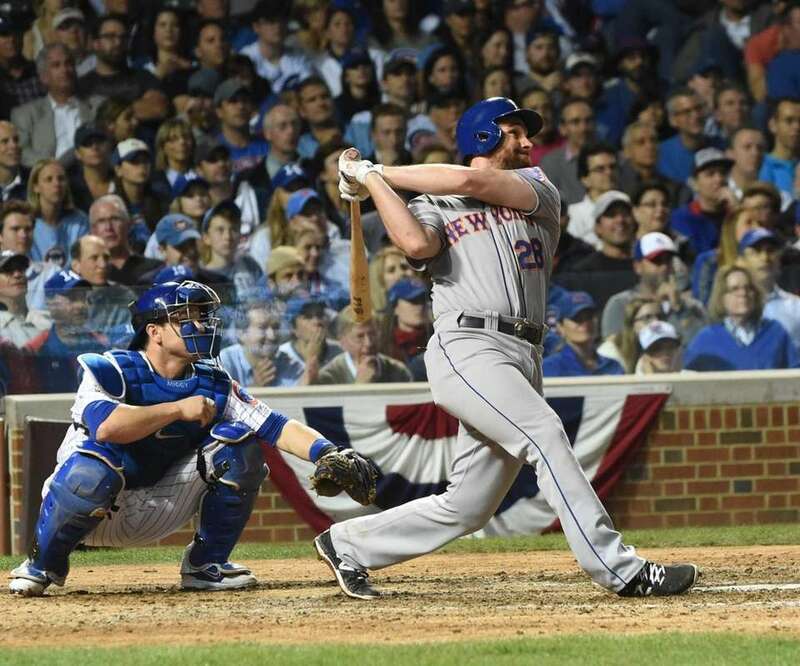 New York Mets second baseman Daniel Murphy (28) hits a fourth-inning single during Game 4 of the NLCS against the Chicago Cubs at Wrigley Field on Wednesday, Oct. 21, 2015. 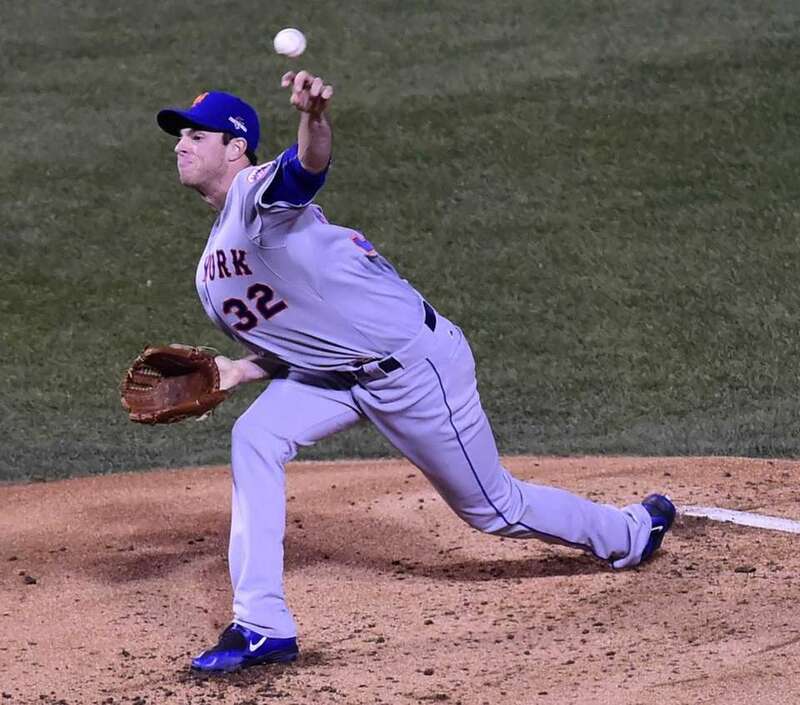 New York Mets starting pitcher Steven Matz (32) delivers the pitch in the second inning during Game 4 of the NLCS against the Chicago Cubs at Wrigley Field on Wednesday, Oct. 21, 2015. 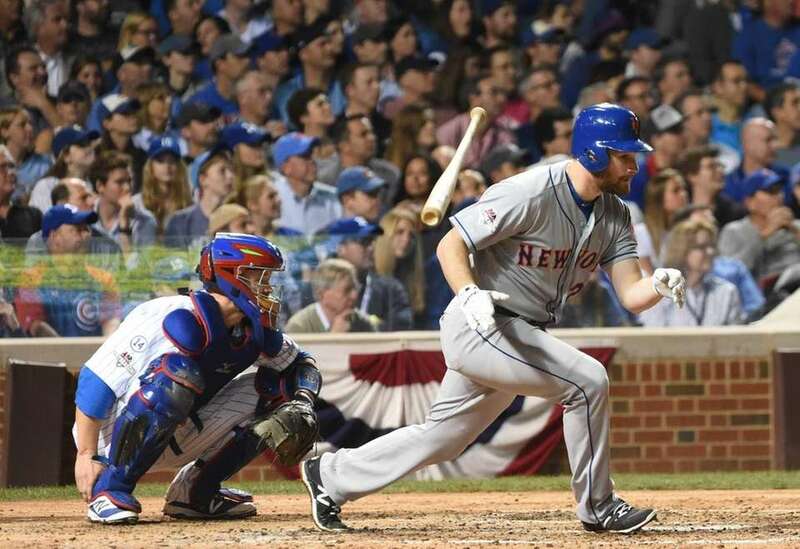 New York Mets first baseman Lucas Duda (21) hits a two-run double in the second inning during Game 4 of the NLCS against the Chicago Cubs at Wrigley Field on Wednesday, Oct. 21, 2015. 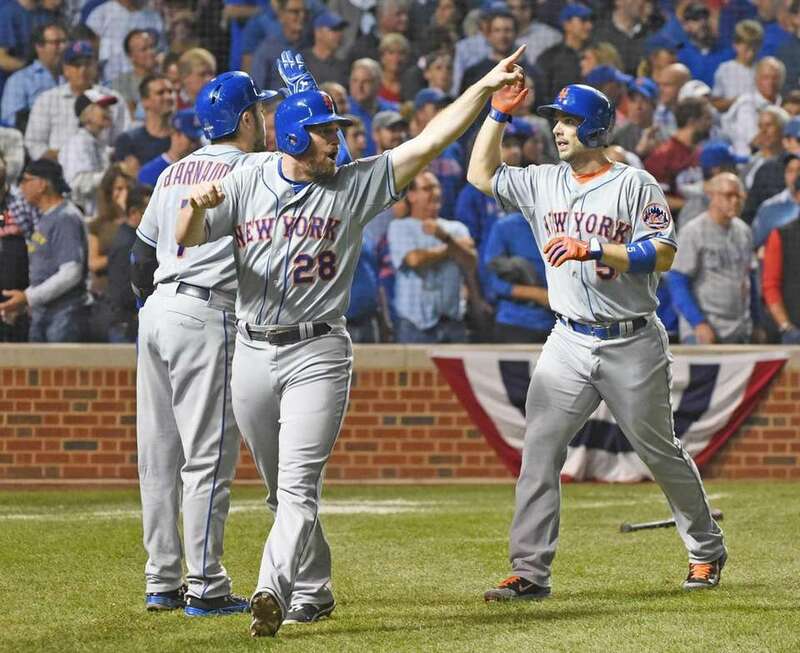 New York Mets catcher Travis d'Arnaud (7) high-fives teammates New York Mets second baseman Daniel Murphy (28) as New York Mets third baseman David Wright (5) is right behind him after a two-run double hit by New York Mets first baseman Lucas Duda (21) in the second inning during Game 4 of the NLCS against the Chicago Cubs at Wrigley Field on Wednesday, Oct. 21, 2015. 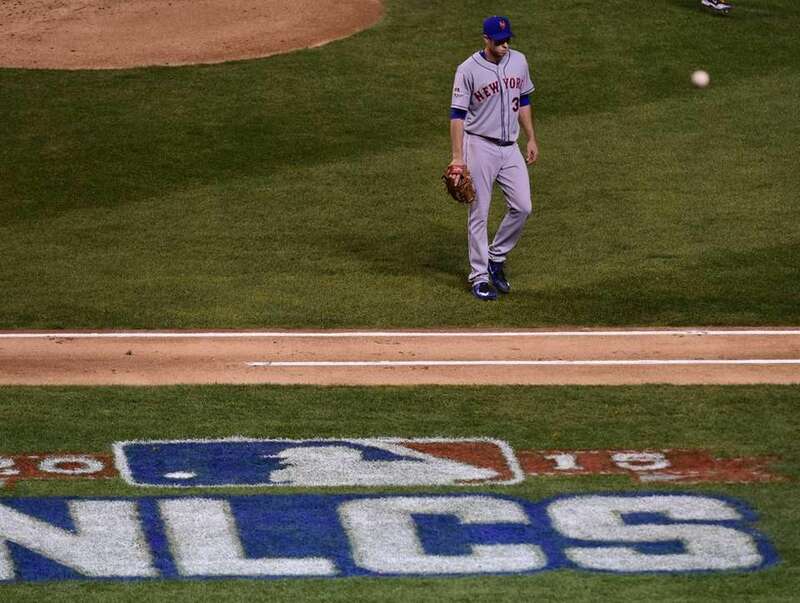 New York Mets starting pitcher Steven Matz (32) walks to the dugout after the first inning during Game 4 of the NLCS against the Chicago Cubs at Wrigley Field on Wednesday, Oct. 21, 2015. 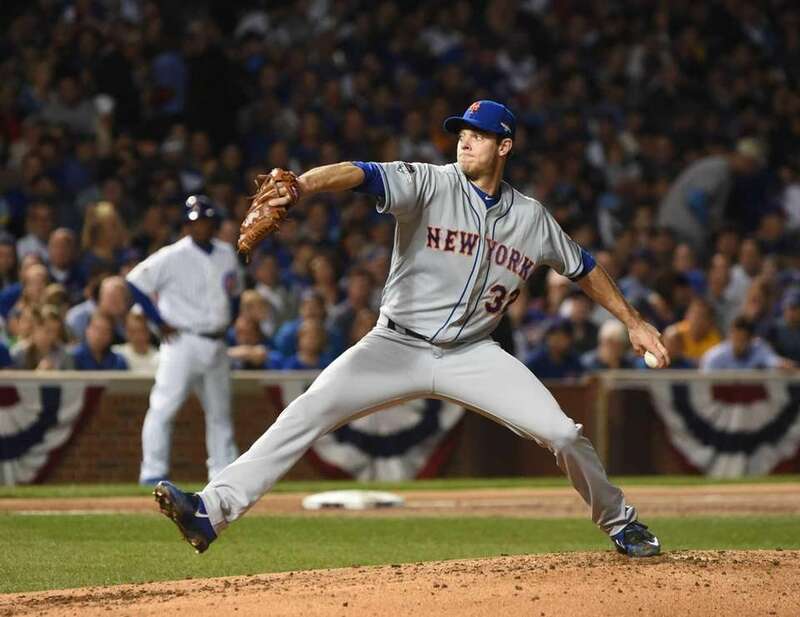 New York Mets starting pitcher Steven Matz (32) delivers the pitch in first inning during Game 4 of the NLCS against the Chicago Cubs at Wrigley Field on Wednesday, Oct. 21, 2015. 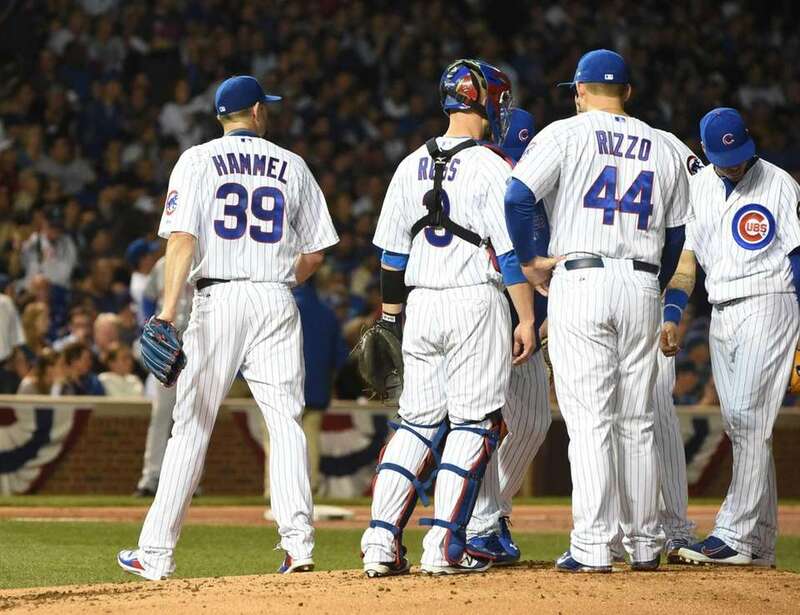 Chicago Cubs starting pitcher Jason Hammel is taken out of game after an inning and a half during Game 4 of the NLCS against the New York Mets at Wrigley Field on Wednesday, Oct. 21, 2015. 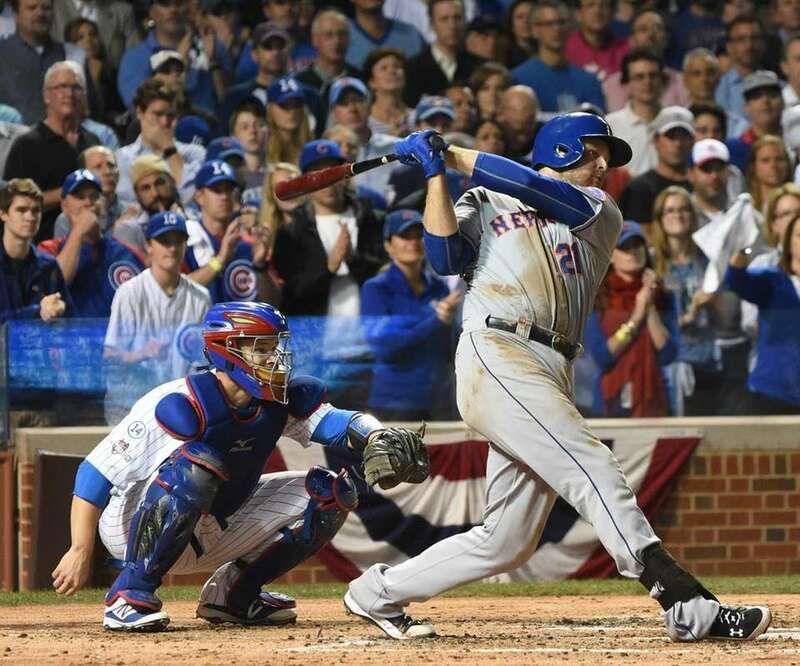 New York Mets first baseman Lucas Duda gets to the bag ahead of Chicago Cubs centerfielder Dexter Fowler in the first inning during Game 4 of the NLCS against the Chicago Cubs at Wrigley Field on Wednesday, Oct. 21, 2015. 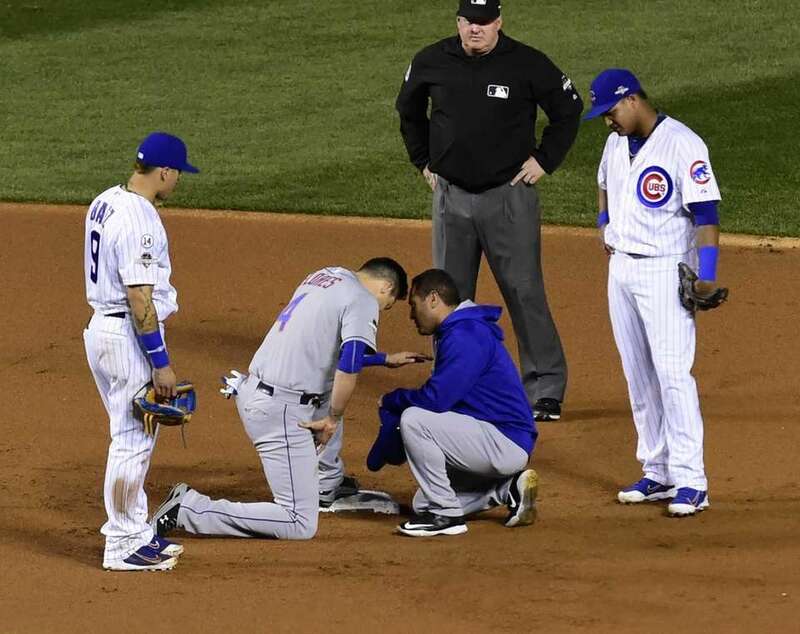 New York Mets trainer Ray Ramirez tends to New York Mets shortstop Wilmer Flores (4) after Chicago Cubs second baseman Javier Baez (9) came down on his head while stealing second base in the first inning during Game 4 of the NLCS against the Chicago Cubs at Wrigley Field on Wednesday, Oct. 21, 2015. 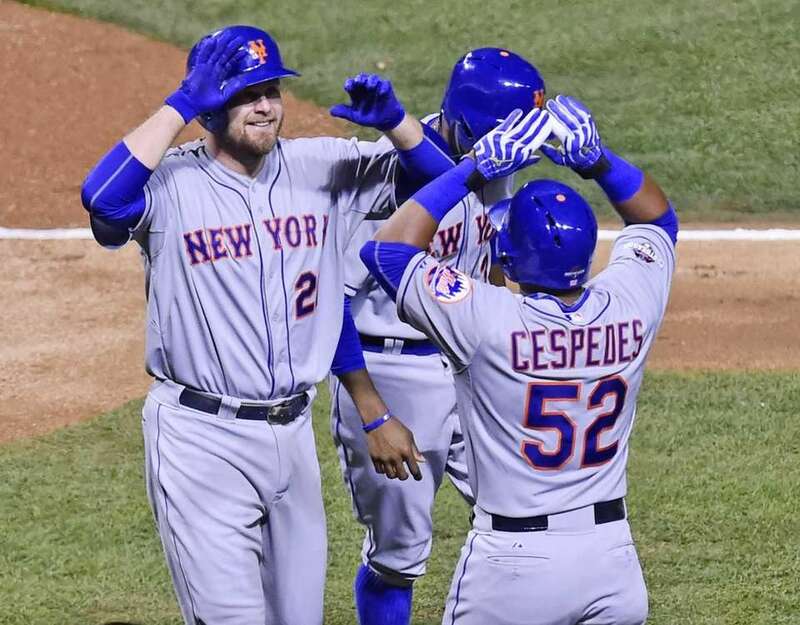 New York Mets first baseman Lucas Duda (21) is all smiles as he high-fives New York Mets centerfielder Yoenis Cespedes (52) after his three-run home run in the first inning during Game 4 of the NLCS against the Chicago Cubs at Wrigley Field on Wednesday, Oct. 21, 2015. 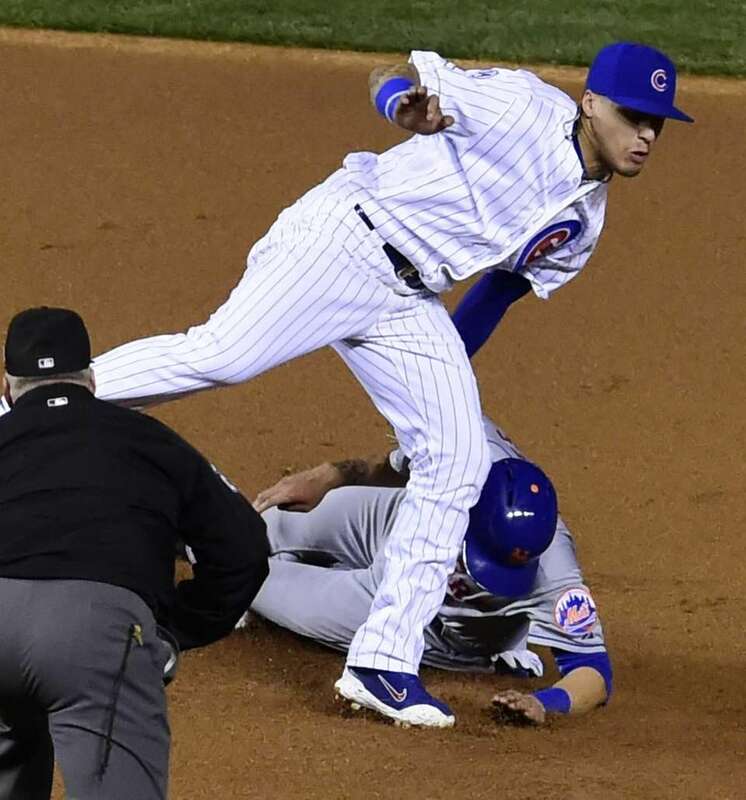 New York Mets shortstop Wilmer Flores (4) steals secondnd base as Chicago Cubs second baseman Javier Baez (9) comes down on his head in the first inning during Game 4 of the NLCS against the Chicago Cubs at Wrigley Field on Wednesday, Oct. 21, 2015. 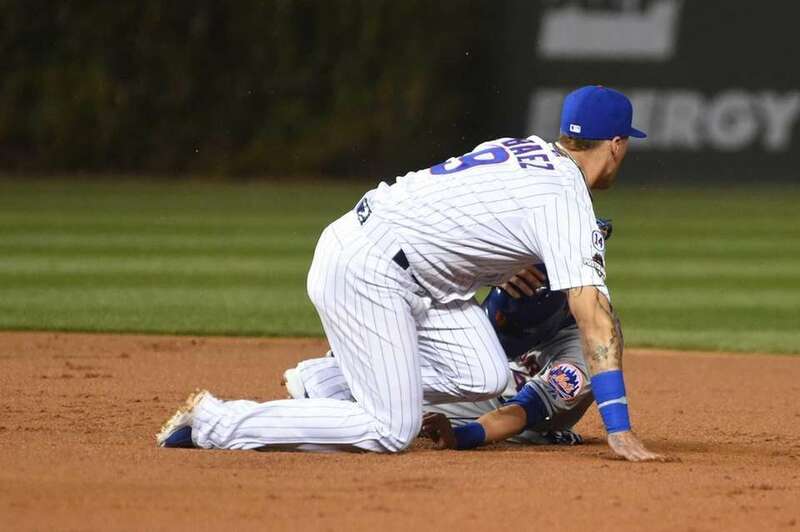 New York Mets shortstop Wilmer Flores (4) gets hit in the head after he steals second base on Chicago Cubs second baseman Javier Baez (9) in the first inning during Game 4 of the NLCS against the Chicago Cubs at Wrigley Field on Wednesday, Oct. 21, 2015. 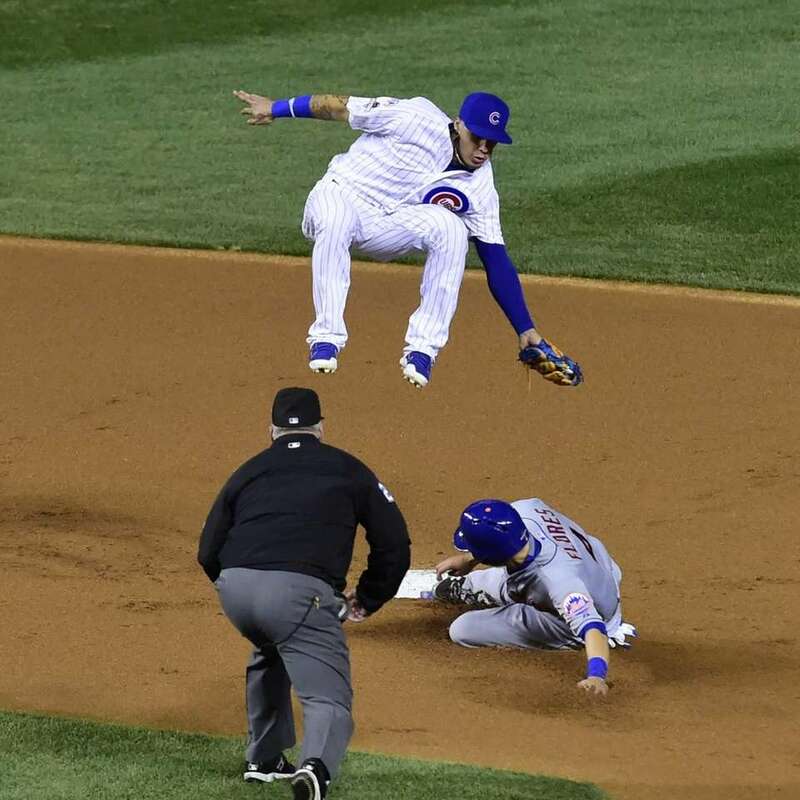 New York Mets shortstop Wilmer Flores (4) steals second base as Chicago Cubs second baseman Javier Baez (9) comes down on his head in the first inning during Game 4 of the NLCS against the Chicago Cubs at Wrigley Field on Wednesday, Oct. 21, 2015. 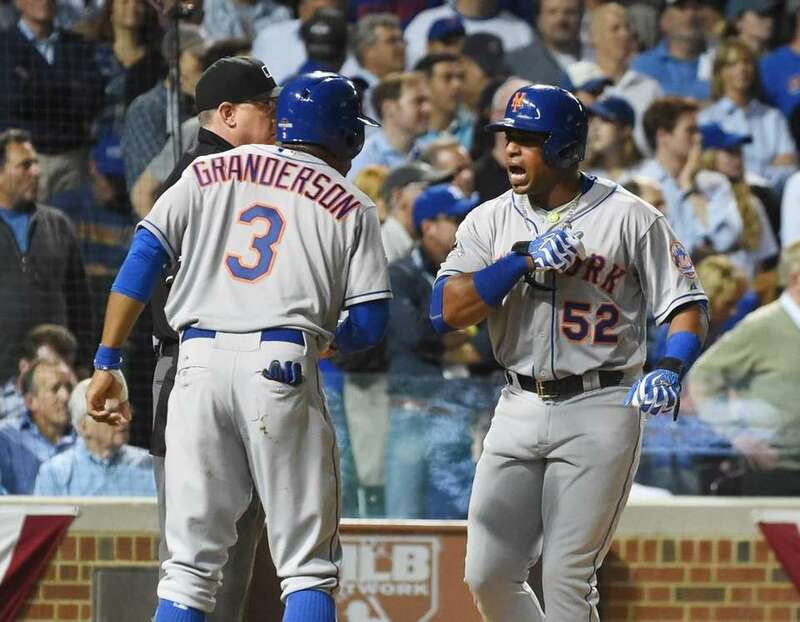 New York Mets rightfielder Curtis Granderson (3) celebrates with New York Mets centerfielder Yoenis Cespedes (52) at home after New York Mets first baseman Lucas Duda (21) hit a three-run homer in the first inning during Game 4 of the NLCS against the Chicago Cubs at Wrigley Field on Wednesday, Oct. 21, 2015. 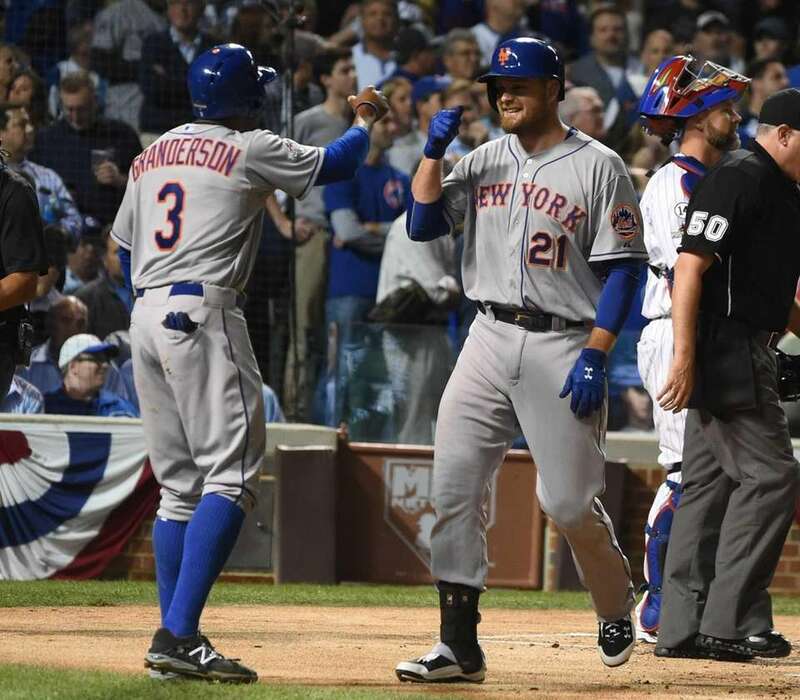 New York Mets first baseman Lucas Duda (21) is all smiles as he crosses the plate to greet New York Mets rightfielder Curtis Granderson (3) after his three-run home run in the first inning during Game 4 of the NLCS against the Chicago Cubs at Wrigley Field on Wednesday, Oct. 21, 2015. 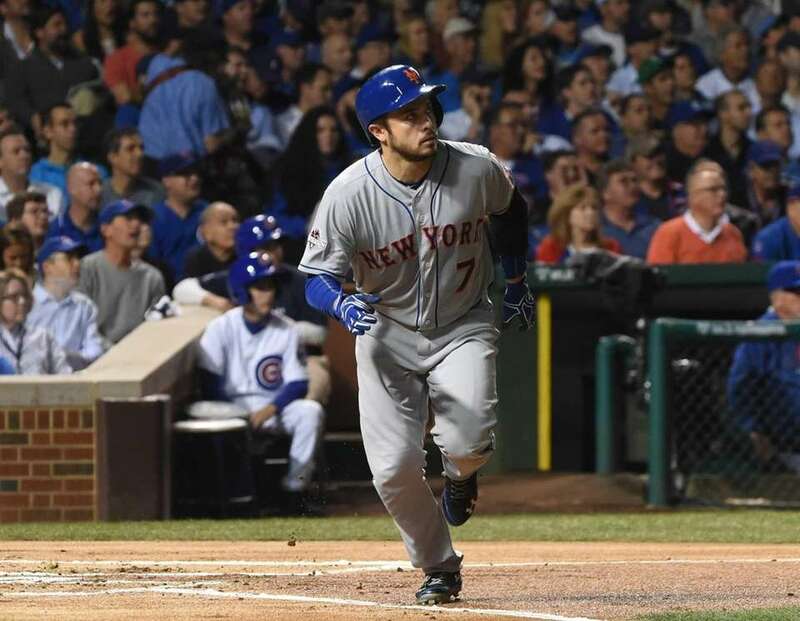 New York Mets catcher Travis d'Arnaud watches his solo home run in the first inning during Game 4 of the NLCS against the Chicago Cubs at Wrigley Field on Wednesday, Oct. 21, 2015. 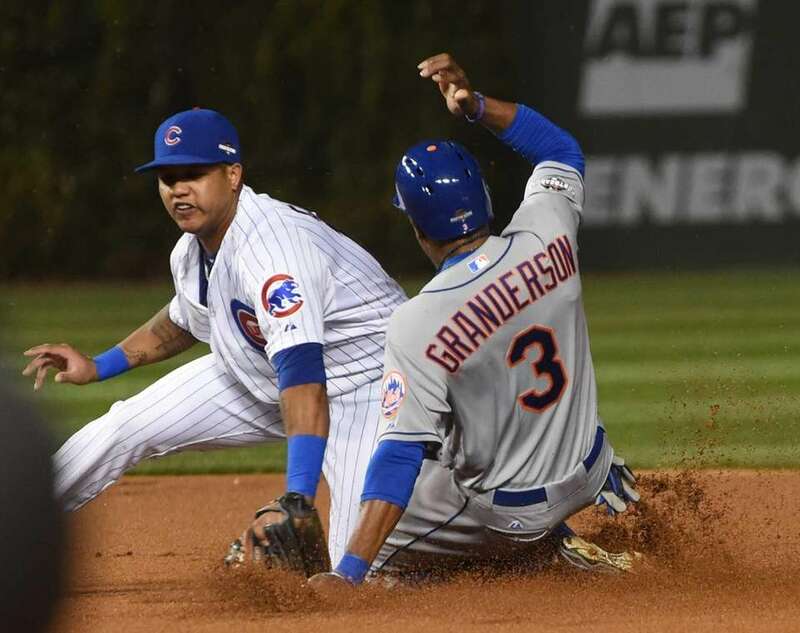 New York Mets right fielder Curtis Granderson (3) steals second base on Chicago Cubs shortstop Starlin Castro (13) in the first inning during Game 4 of the NLCS against the Chicago Cubs at Wrigley Field on Wednesday, Oct. 21, 2015. 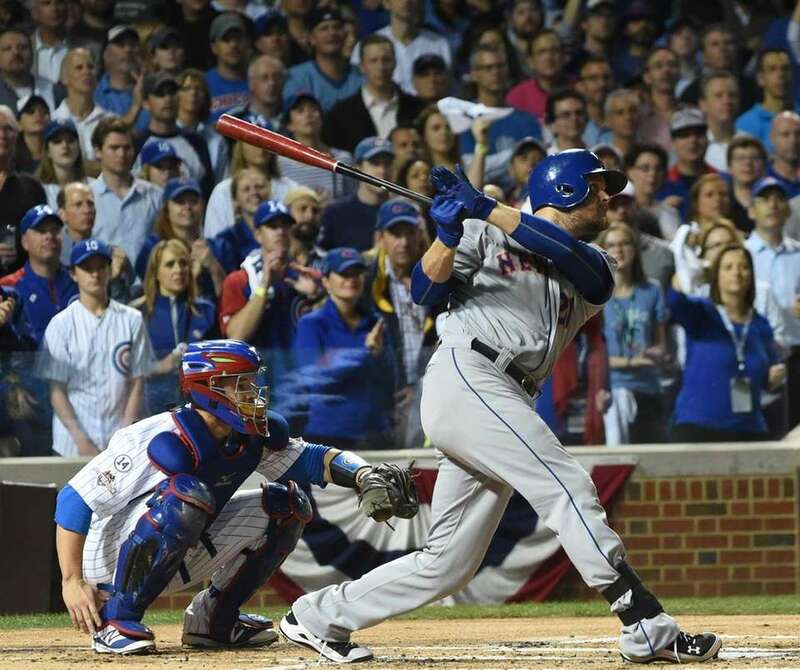 New York Mets first baseman Lucas Duda (21) hits a first inning, three-run homer during Game 4 of the NLCS against the Chicago Cubs at Wrigley Field on Wednesday, Oct. 21, 2015. 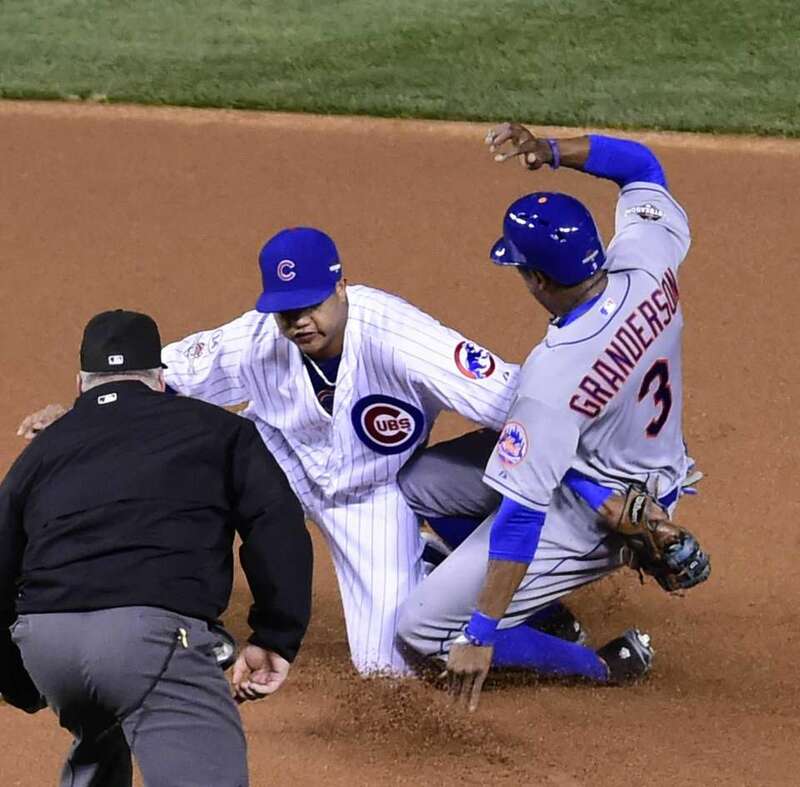 New York Mets rightfielder Curtis Granderson (3) is safe stealing second base as Chicago Cubs shortstop Starlin Castro (13) is late with the tag in the first inning during Game 4 of the NLCS against the Chicago Cubs at Wrigley Field on Wednesday, Oct. 21, 2015. 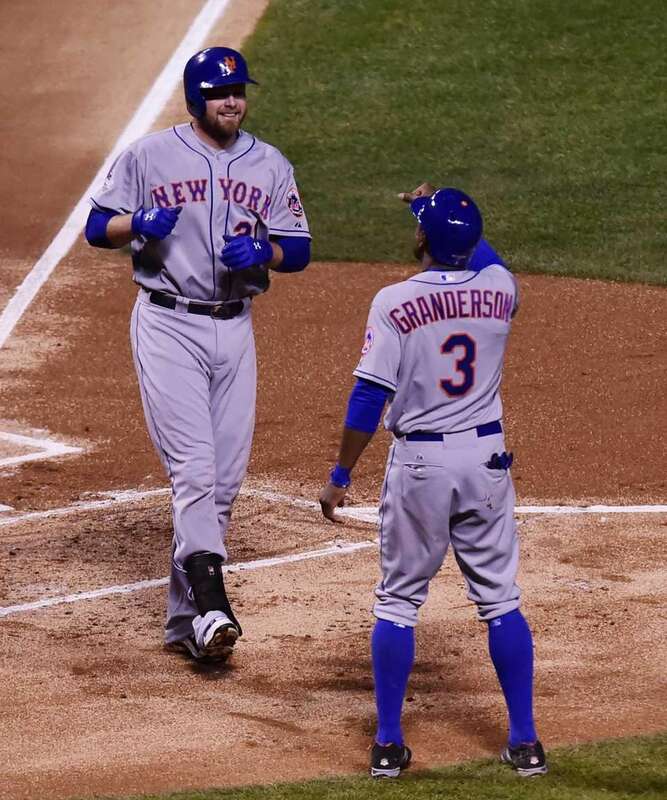 New York Mets rightfielder Curtis Granderson (3) waits at home to celebrate with New York Mets first baseman Lucas Duda (21) after Duda hit a three-run homer in first inning during Game 4 of the NLCS against the Chicago Cubs at Wrigley Field on Wednesday, Oct. 21, 2015. 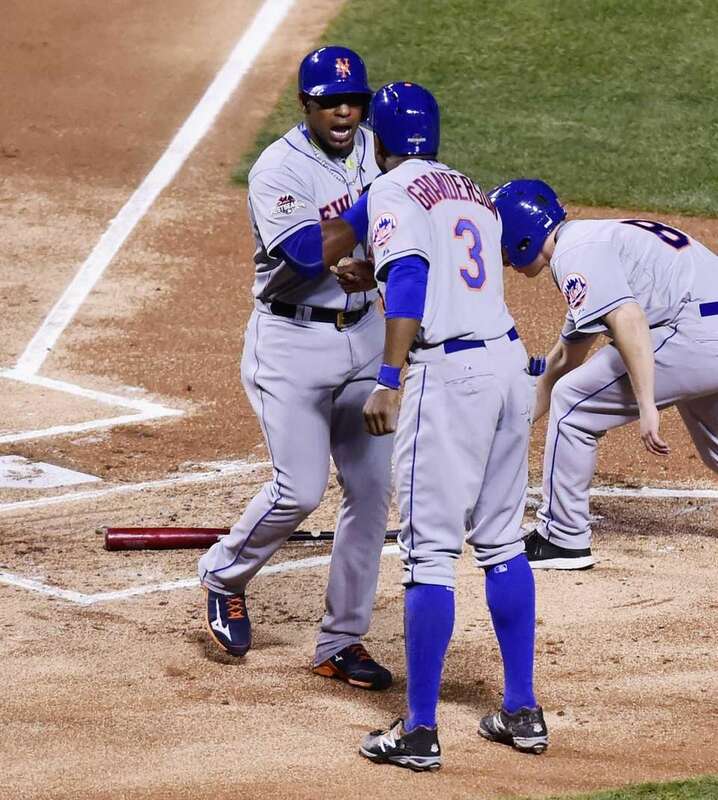 New York Mets centerfielder Yoenis Cespedes (52) and New York Mets rightfielder Curtis Granderson (3) celebrate at home after they are knocked in by New York Mets first baseman Lucas Duda (21) in the first inning on his three-run home run during Game 4 of the NLCS against the Chicago Cubs at Wrigley Field on Wednesday, Oct. 21, 2015. 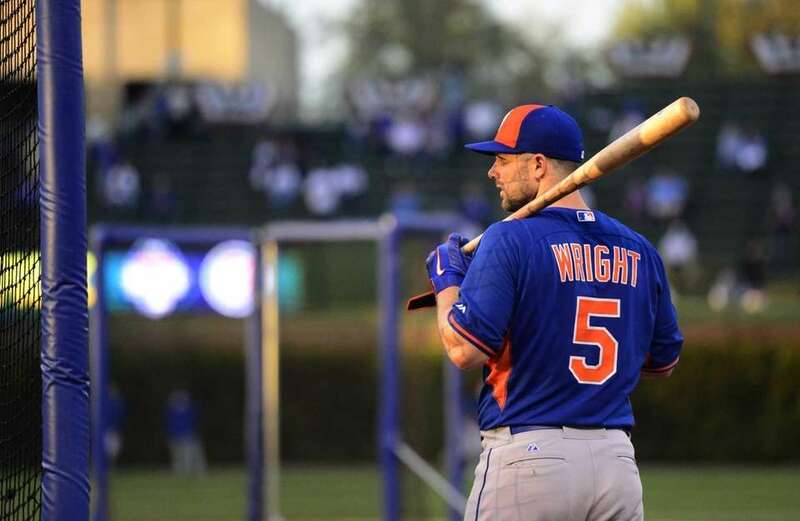 New York Mets third baseman David Wright (5) looks on during batting practice before Game 4 of the NLCS against the Chicago Cubs at Wrigley Field on Wednesday, Oct. 21, 2015. 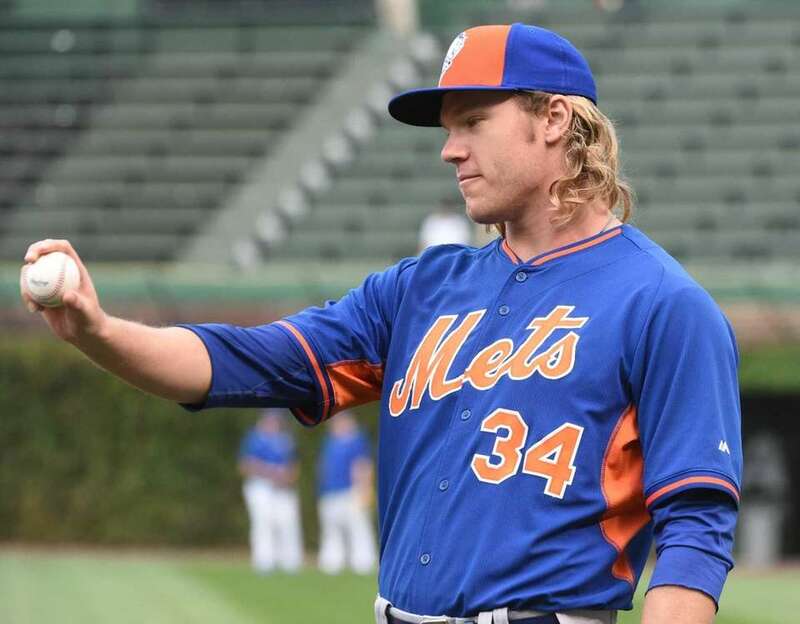 New York Mets starting pitcher Noah Syndergaard (34) looks at a ball during warmups during Game 4 of the NLCS against the Chicago Cubs at Wrigley Field on Wednesday, Oct. 21, 2015. 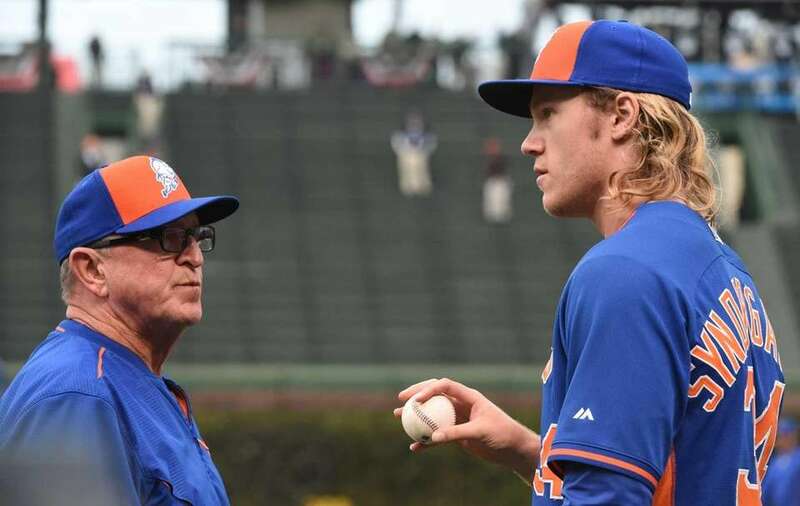 New York Mets pitching coach Dan Warthen (59) talks with New York Mets starting pitcher Noah Syndergaard (34) during batting practice before Game 4 of the NLCS against the Chicago Cubs at Wrigley Field on Wednesday, Oct. 21, 2015. 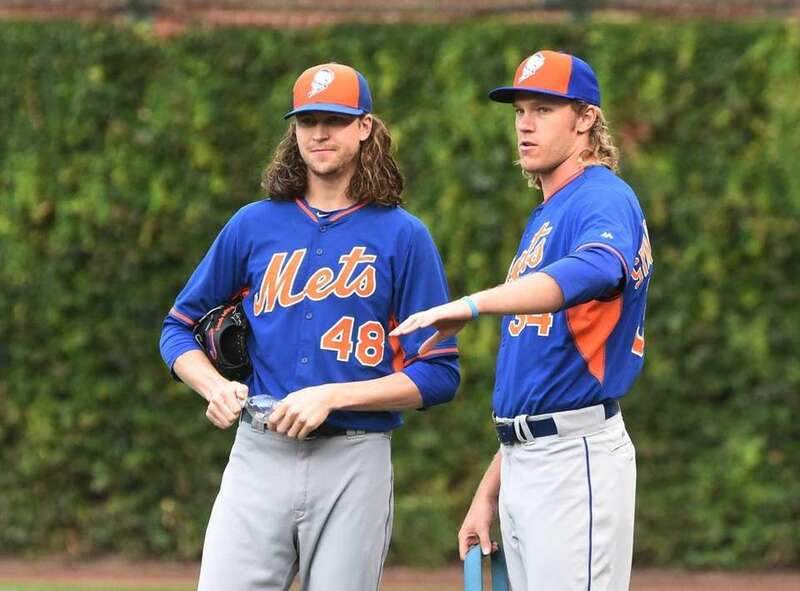 New York Mets starting pitcher Jacob deGrom (48) and New York Mets starting pitcher Noah Syndergaard (34) look on during batting practice during Game 4 of the NLCS against the Chicago Cubs at Wrigley Field on Wednesday, Oct. 21, 2015. 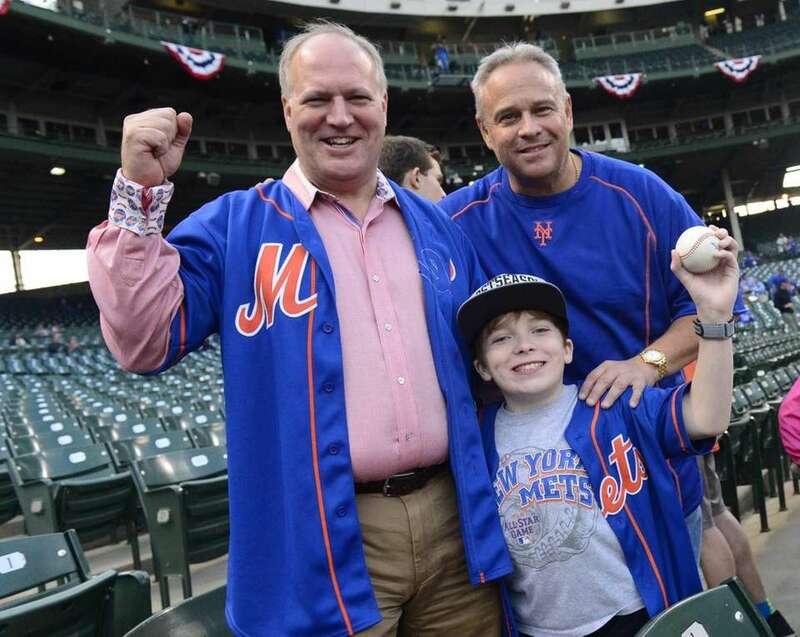 Michael Petruzzelli and his son Jake, 12, of Melville along with Andrew San Marco of Connecticut cheer on their New York Mets during batting practice befire Game 4 of the NLCS against the Chicago Cubs at Wrigley Field on Wednesday, Oct. 21, 2015. 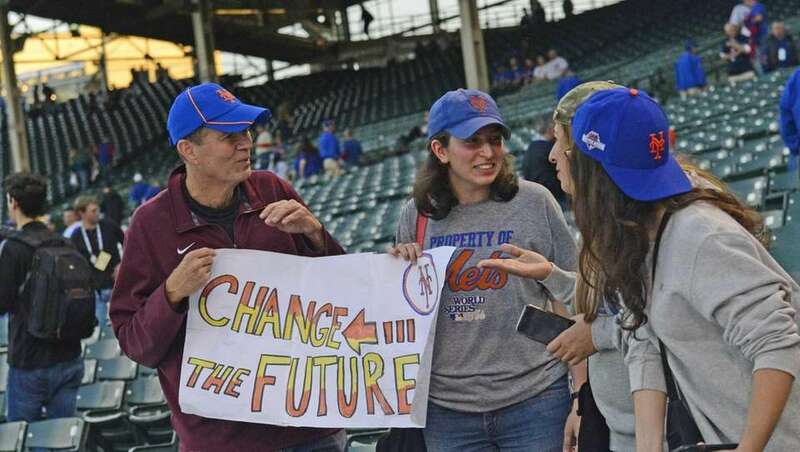 These New York Mets fans are Back to the Future as the Mets take batting practice during Game 4 of the NLCS against the Chicago Cubs at Wrigley Field on Wednesday, Oct. 21, 2015. 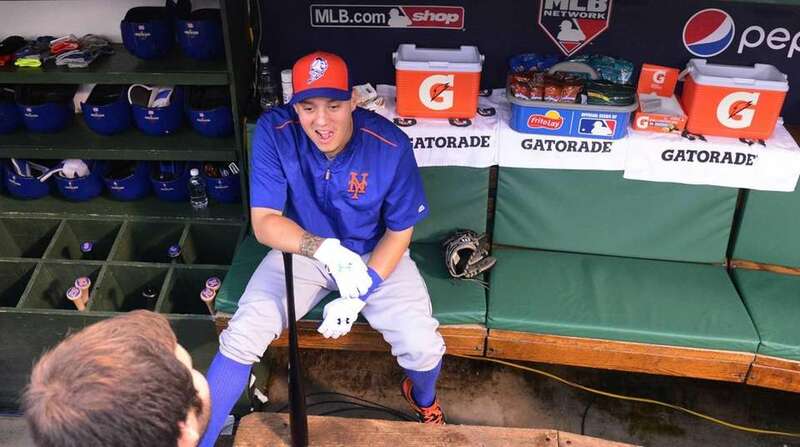 New York Mets shortstop Wilmer Flores (4) talks to the media at batting practice during Game 4 of the NLCS against the Chicago Cubs at Wrigley Field on Wednesday, Oct. 21, 2015. 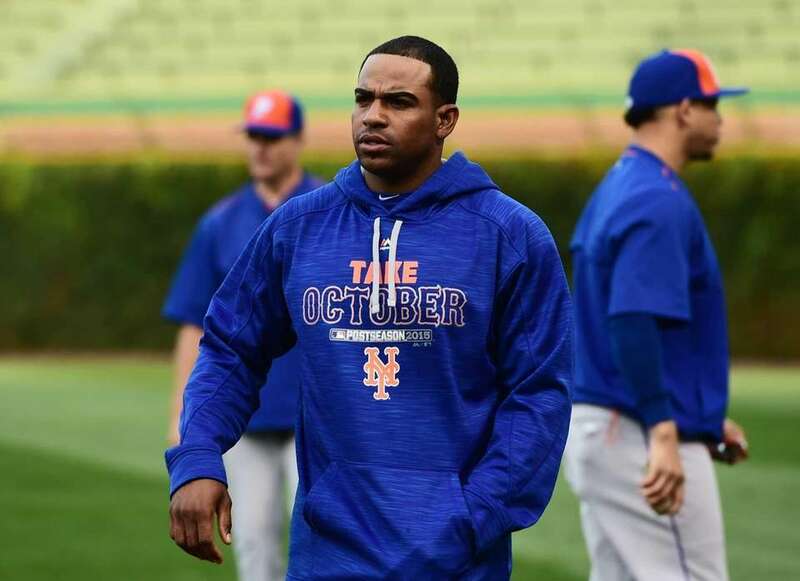 New York Mets centerfielder Yoenis Cespedes (52) walks to the dugout during warmups during Game 4 of the NLCS against the Chicago Cubs at Wrigley Field on Wednesday, Oct. 21, 2015. 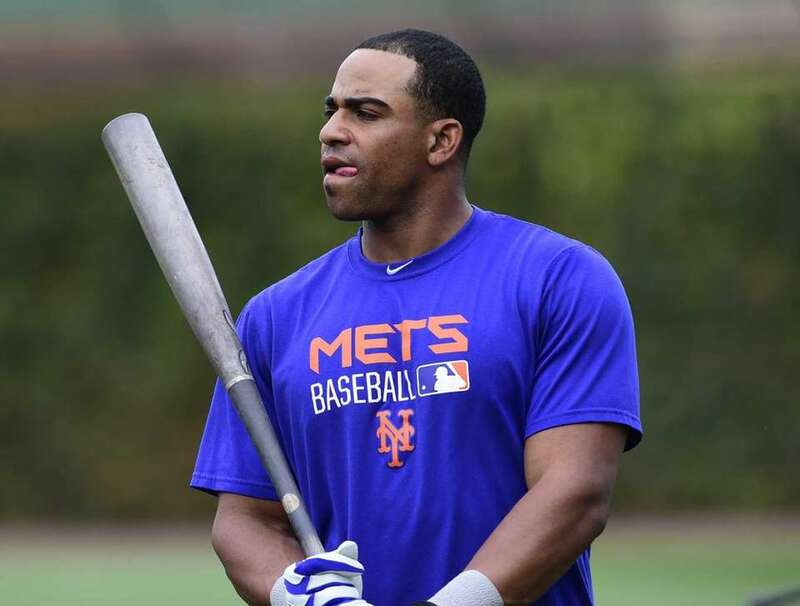 New York Mets centerfielder Yoenis Cespedes (52) walks from the batting cages prior to batting practice during Game 4 of the NLCS against the Chicago Cubs at Wrigley Field on Wednesday, Oct. 21, 2015. 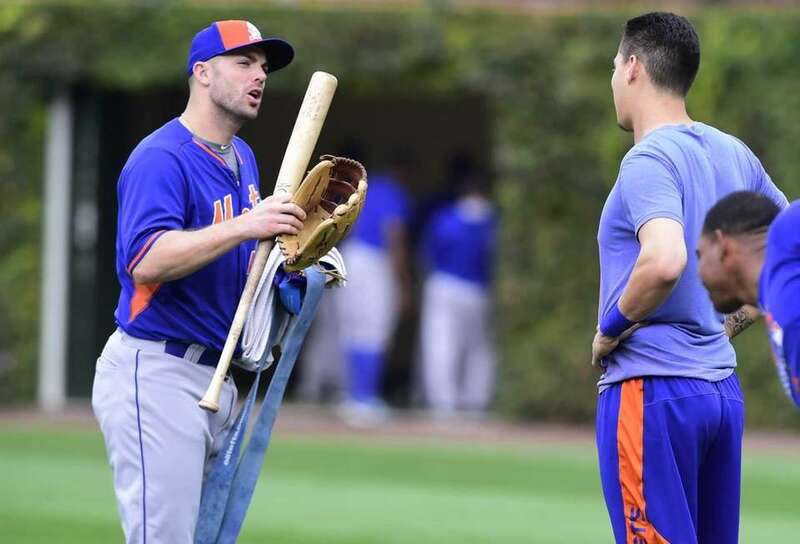 New York Mets third baseman David Wright (5) talks with New York Mets shortstop Wilmer Flores (4) as he walks to the batting cages prior to batting practice during Game 4 of the NLCS against the Chicago Cubs at Wrigley Field on Wednesday, Oct. 21, 2015. 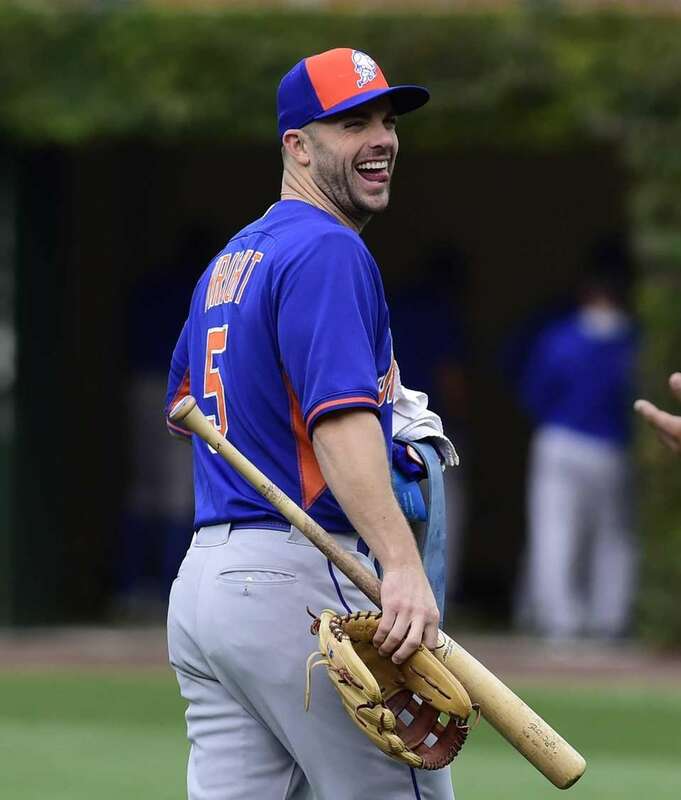 New York Mets third baseman David Wright (5) walks to the batting cages prior to batting practice during Game 4 of the NLCS against the Chicago Cubs at Wrigley Field on Wednesday, Oct. 21, 2015. 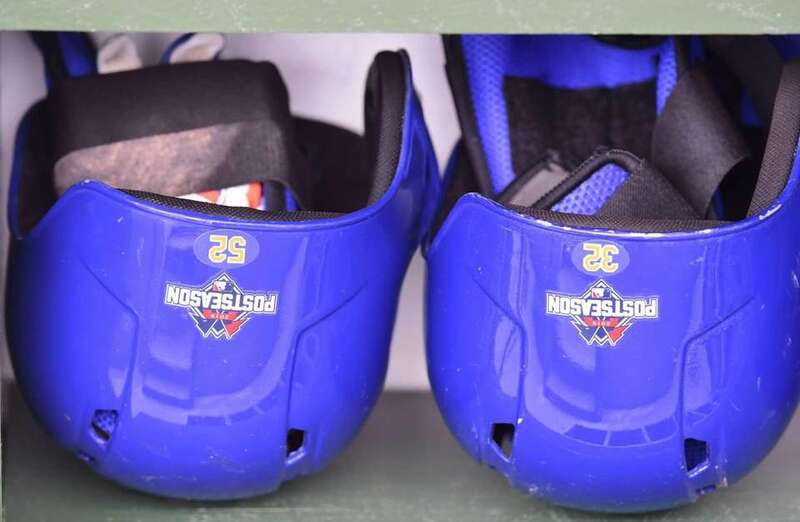 New York Mets center fielder Yoenis Cespedes (52) and New York Mets starting pitcher Steven Matz (32) helmets are in place in the dugout during Game 4 of the NLCS against the Chicago Cubs at Wrigley Field on Wednesday, Oct. 21, 2015. 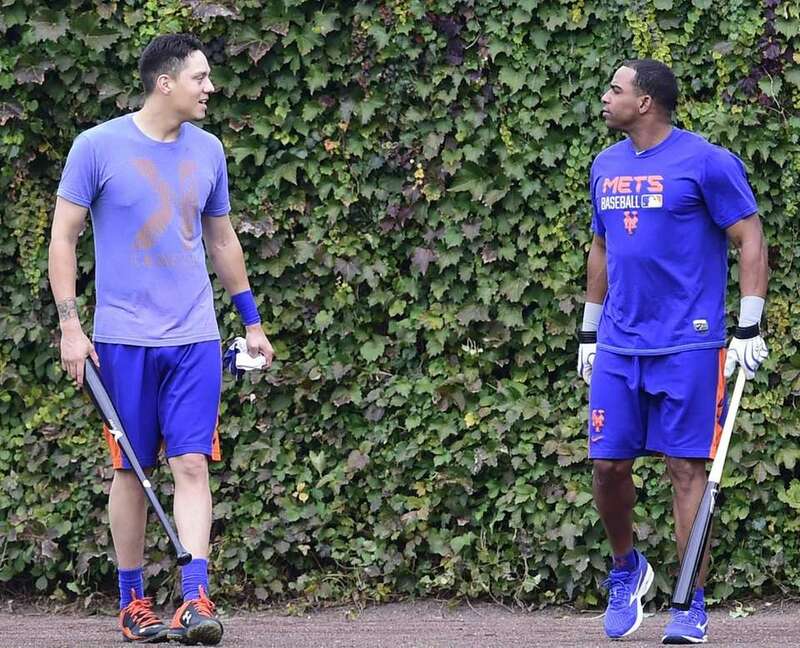 New York Mets shortstop Wilmer Flores (4) and New York Mets center fielder Yoenis Cespedes (52) walk from the batting cages prior to batting practice during Game 4 of the NLCS against the Chicago Cubs at Wrigley Field on Wednesday, Oct. 21, 2015.